Whether you live alone and don't need a huge fridge, have a small kitchen with little choice of layout or you'd like an extra fridge to store your food (*ahem* Prosecco), you'll be looking for the very best under counter fridges. Available in both freestanding and integrated versions, under counter fridges are, for the most part, affordable, cheap to run and quiet. Our guide below takes you through the options to help you get the best for your money. Done with fridges? Have a read of our appliances guides for more great buys. If your under counter fridge is just for you, you won't need to worry too much about the capacity. Average capacity for this type of fridge is around the 120ltr mark, with cheaper models falling under the hundreds. Ranging from D to A+++, we suggest purchasing a fridge with an energy efficiency closer to the latter. Anything quieter than 40 decibels (dB) is considered a quiet fridge – something to bear in mind if you're buying an under counter fridge, live in a flat and have a bedroom right next to the kitchen. Putting an extra fridge in a garage? One with a higher decibel rating won't bother you. If you prefer your kitchen appliances disguised, then opt for an integrated fridge; if you're not fussed, go for a freestanding model, as they're much cheaper. Perfect for storing your fresh food (seven bags of it, to be exact), this Lec under-counter model has everything you need in your next fridge, making it our top pick of the best under counter fridge you can buy. Not only does it have an energy rating of A+, but it also has an auto defrost setting to save you doing the hard work, improved airflow technology to keep your groceries fresher for longer and it's ideal for those who live in an open plan home or a flat, as it's quiet. There's no need to worry about it fitting into your existing kitchen layout, either, as it has a reversible door. With adjustable shelves for those who like to rearrange their fridge on a regular basis (guilty), the integrated NEFF N50 KI1212S30G has a large 144ltr capacity, with the ability to hold eight bags of food shopping, no hassle. It's ultra quiet for those who live across one floor and are worried about the noise, and thanks to its FreshSense technology, the temperature inside will stay consistently cool, so in turn your food will stay fresher for longer. The best part? It has an A++ energy rating, meaning the annual energy cost will be extremely low. 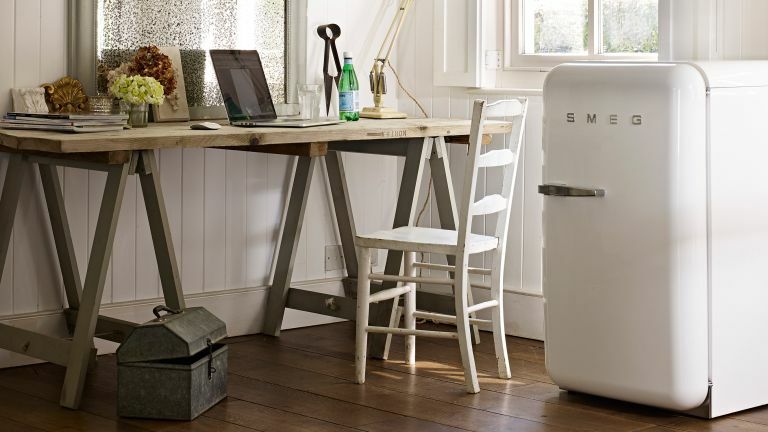 Retro on the outside yet advanced on the inside, this sweet Smeg fridge is a must-have for vintage kitchens. It's available in a range of colours, and its curved lines really stand out, a far cry from the usual offerings that’ll give your space an instant dose of ‘50s diner cool. It also boasts an A+ efficiency rating, an auto-defrost function and it's environmentally-friendly as it's free from harmful CFC and HFC gases; so it’s certainly not a case of style over substance. For those who don't want to purchase an additional freezer as they don't have the space, this fridge has a 13ltr compartment dedicated to storing frozen food. Ideal for a tub of ice cream, a bag of frozen chips and a portion of homemade chilli. This is, by far, our top pick of the best under counter fridge for those after something to fit in their vintage or retro kitchen. Cheaper doesn't always mean fewer features, in fact, it's quite the opposite when it comes to the Gorenje Essential Line RI4091AW integrated fridge. It has a huge 145ltr capacity – eight shopping bags if you were wondering, as well as a pretty decent energy rating of A+. It has an auto defrost function, and a drawer specifically for your fruit and veg. There are four adjustable shelve,s too, and plenty of storage in the door for your bottles and eggs. The best part is that it's integrated, so you and your guests won't even notice it in your kitchen. On a budget? This fridge has plenty of storage, is energy efficient, quiet and it's affordable - result! For those who don't want to fork out a lot on an under counter fridge, this Fridgemaster model is your best bet. It has an energy rating of A+, it's quiet, has lots of shelving and drawers, especially in the door, and it has an auto defrost function. It also has a mini freezer compartment built-in which can fit your ice cube trays into. Our only complaint, if we're being picky, is that the capacity of this fridge is smaller than others (because of the icebox), but if it's only catering to one or two people, then this shouldn't be a problem. The best under counter fridge for a compact kitchen, we think.